Democratic Sen. Kay Hagan speaks with volunteers and supporters during an event at a campaign office in Statesville, North Carolina in September. Democratic Sen. Kay Hagan has been sailing against the wind all year in North Carolina — maintaining a consistent lead in a state won by Mitt Romney in 2012 while other Democratic incumbents in red states falter. Democratic senators Mark Begich, Mary Landrieu and Mark Pryor are all underdogs in their races. Hagan remains the favorite. And yet, Hagan’s chances of beating Republican Thom Tillis have slipped. She has a 71 percent of winning, according to the latest FiveThirtyEight Senate forecast. That’s down from 77 percent a week ago and 79 percent 10 days ago. There was a stretch from early September to early October when Hagan led in 15 consecutive non-partisan sponsored surveys. Her average lead in those polls was 3.8 percentage points. Her median lead was 4 points. Since Oct. 1, though, Hagan’s average lead has been just under 1 percentage point (the median has been 2 points). And a High Point University poll released last week and a Gravis Marketing survey from this week showed her trailing. Gravis may not be a great pollster, but they had previously shown Hagan leading. Additionally, the new Gravis survey found Hagan down by 5 percentage points, a large enough deficit that the poll had an effect on the forecast even after the model accounts for Gravis’ house effect and past accuracy. Hagan’s shrunken lead adds uncertainty to the forecast. It is relatively rare for a polling average to be off by 4 percentage points (Hagan’s previous edge) in a race surveyed as often North Carolina. It’s more common for the polls to be off by 2 points. It is even rarer for the polls to be off when they are all showing the same thing, as they were in North Carolina before the High Point and Gravis surveys. Remember when Senate Majority Leader Harry Reid shocked the public pollsters in his 2010 Senate race? He led in two of the final 13 public polls (15 percent). Compare that to the presidential election in Ohio in 2012. Although the average lead for the leading candidates in the two races were about the same, President Obama was down in only three of about the final 45 polls taken by non-partisan sponsors (7 percent). The fact that Hagan now trails, even if in just a few polls, shouldn’t be underplayed. It increases the chance the polling average will be off. 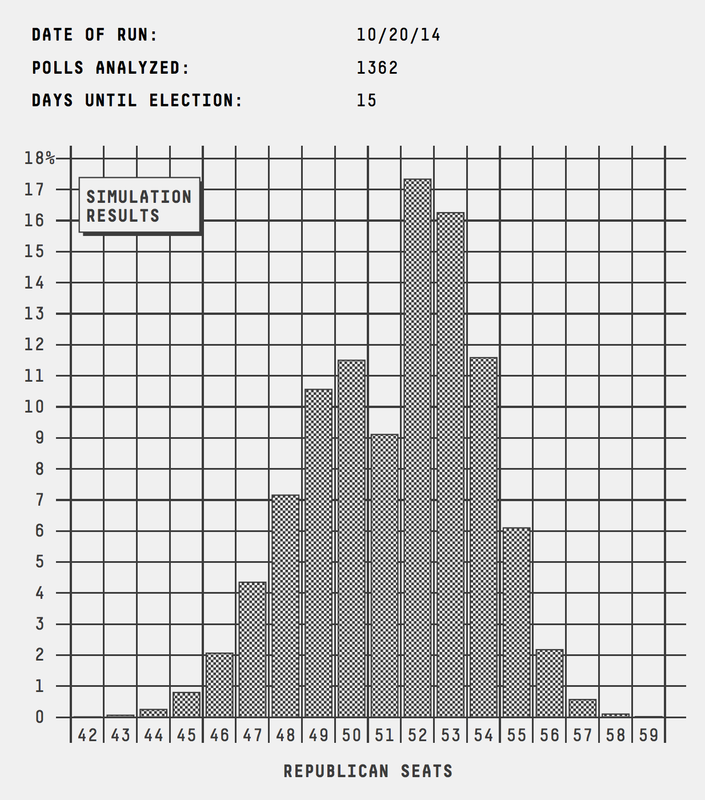 Finally, the fundamentals portion of the FiveThirtyEight Senate model shows how much Hagan has been over-performing. The fundamentals, which include factors such as the state’s historical partisan lean and candidate fundraising, project Tillis to win by just over a percentage point. The margin of error on the fundamentals estimates is large, but it does tell us that Tillis is underperforming. Every other Democratic incumbent who is trailing in the fundamentals is also trailing in our overall forecast. That includes Begich, Landrieu, Pryor as well as Sen. Mark Udall in Colorado. Compare North Carolina to New Hampshire, where Sen. Jeanne Shaheen is up by just under 3 percentage points in our forecast. Shaheen is performing near where the fundamentals suggests she should. She also happens to have a much higher approval rating than Hagan, while her Republican opponent, Scott Brown, holds a similar favorable rating to Tillis’ (low). Indeed, perhaps the main thing saving Hagan is that Tillis is as unpopular as he is. His net favorable rating (favorable rating minus unfavorable rating) in a Suffolk University poll two weeks ago was -6.2 percentage points. Hagan’s was +4.8 percentage points. Can Hagan continue to be seen as the lesser of two evils, and resist the rightward pull of North Carolina politics? Our forecast suggests she can. That’s just less certain than it was a week ago.